Archcore Steel Buildings offers the P-Model as the ultimate prefab building for use as a personal hobby workshop, RV and vehicle garages, boat storage, commercial storage, or mancave. For over 30 years Archcore has been supplying homeowners, families, and businesses with the perfect solution for their household storage problems. Our pre-engineered arch buildings are manufactured with only highest quality material in the most modern, cost efficient, automated facility and the labor savings are passed on to you. The P-Model is available from 12 - 30 feet wide and unlimited length. The height can be adjusted to suit virtually any application, whether you need a commercial paint booth, recreational vehicle prefab storage building or a hunting lodge. Double your total square footage by adding a loft or mezzanine for extra storage, home office or "in-law" apartment. They give you 100% clearspan open space as the P-building model requires no internal beams or posts for support. Archcore P-Models save you money!!! Since they are fabricated on a computer operated production line, the labor per pound of steel in our buildings is the industry lowest. Infrared sensors, lasers and rigid manual inspection ensure your building will line up perfectly while assembling in the field. This eliminates delays or costly fixes found in other types of building construction. Archcore buildings are totally prefabricated so you and a couple friends can do it yourself without expensive contractors. You will save thousands off construction labor and have the strongest building once the job is complete. We don't sacrifice quality with the type of raw materials as Archcore P-Model buildings are made with the finest US steel available, Galvalume. This proprietary coating on the steel is a patented mixture of aluminum, silicon, and zinc and offers seven times the resistance to rust as galvanized steel. Archcore metal arch buildings are designed to provide you years of maintenance free use and come with a 30 year warranty, the best available. Call today at 1-800-844-1570 or request a free online quote and we will show you how Archcore P-Models are the only way to go for your home hobby workshop or prefab metal garage. The P-Model features a pitched roof for maximum load bearing and structural integrity. 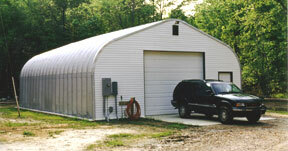 View The Gallery of P-Model Steel Buildings!